We were overjoyed to see colourful “Koyo” autumn leaves in the Japanese town of Nikko during the first few days of November, as predicted by the JR East Autumn sightseeing guide. “Koyo 紅葉 refers to the phenomenon of changing autumn colors, mainly when it occurs to the leaves of deciduous broad-leaf trees before the leaves fall to the ground”. “The species of maple generally determines the color the leaves will change: red, yellow or brown. 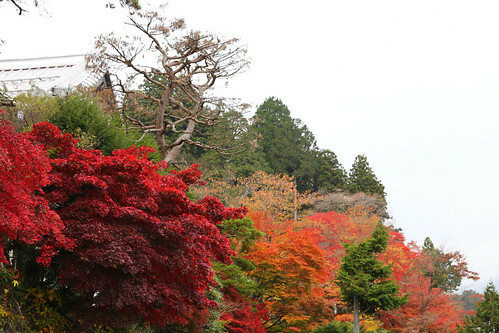 Although the word koyo literally means “red leaves,” it is used to refer to all the colors of autumn leaves. 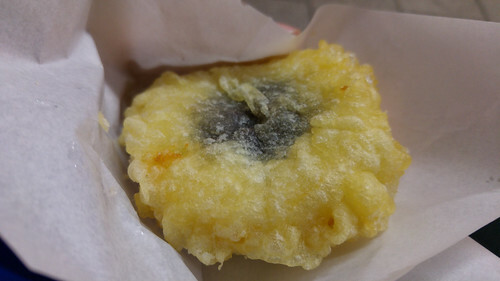 The word oyo refers to yellow leaves, and the word katsuyo refers to brown leaves specifically”. 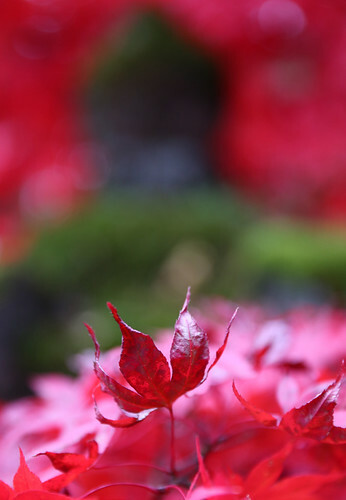 “The koyo season in Japan typically begins in mid-September in Hokkaido to the north, gradually spreading to the southern end of the Japanese archipelago in about 50 days. The change occurs when the low temperature at dawn is about 6 degrees or 7 degrees Celsius, and the viewing season lasts for 20 to 25 days. The exact timing to see the leaves fluctuates somewhat from year to year”. 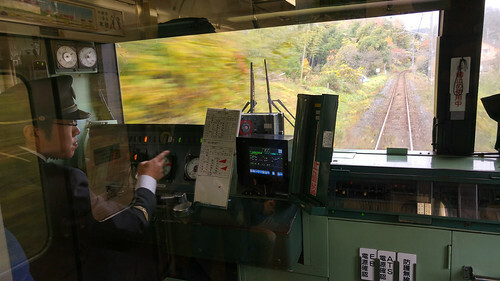 If you don’t have a JR pass then it’s also possible to catch Tobu Railway trains to Nikko. 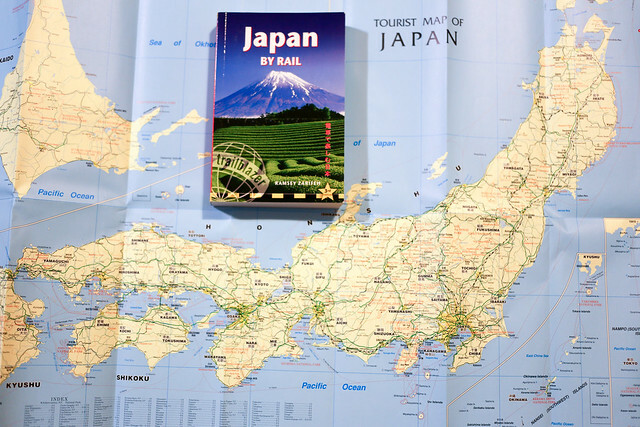 Japan guide has a good comparison of the different JR and Tobu options for trains to Nikko in terms of cost and time. 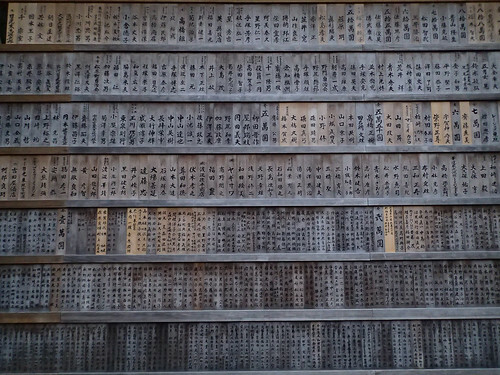 We traveled to Nikko using our JR Passes. 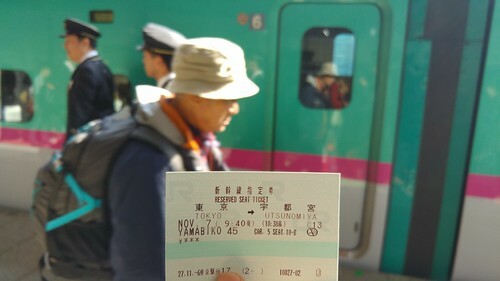 The first part of journey was from Tokyo Station to Utsunomiya on a modern Yamabiko type train capable of speeds up to 240km/hr, travelling on the Tohoku Shinkansen line. 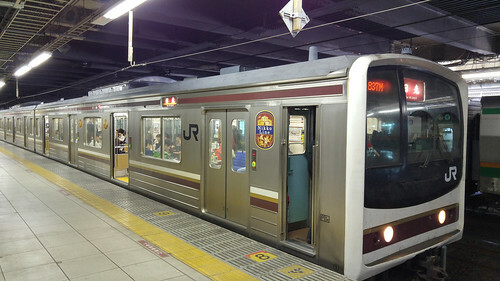 At Utsunomiya we changed to much older local train on the Nikko line. We sat in the front carriage from where we could see the train driver meticulously going through his strictly timed series of tasks during the journey. 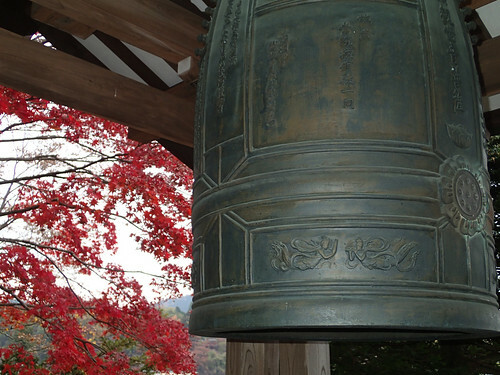 Japan Guide has a great page about Nikko activities and attractions. We decided to stay at the Nikko Station Hotel Classic, which was conveniently located across the road from JR Nikko station. The hotel website was mostly in Japanese so we paid for our Double room via their listing on Booking.com. 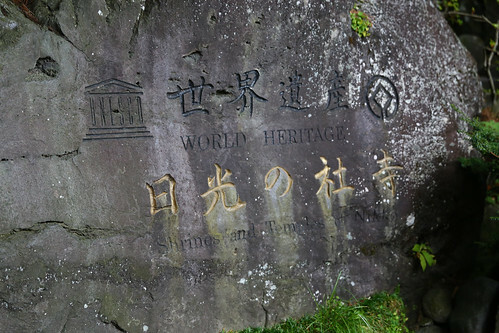 After checking in we refilled our water bottles at the free spring water outlet outside Nikko station, then enjoyed the Koyo leaves display while meandering towards the World Heritage shrines. 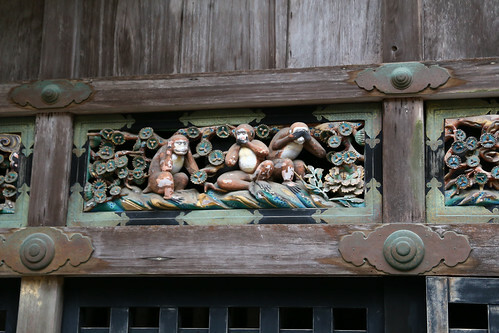 The Toshogu Shrine is Nikko’s main attraction, located about 20 minutes walk from the Nikko Station Hotel Classic. The shrine is the final resting place of Tokugawa Ieyasu, the founder of the Tokugawa Shogunate that ruled Japan for over 250 years until 1868. 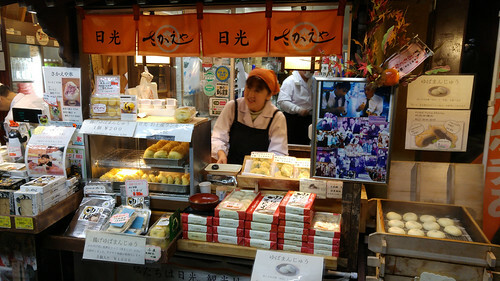 Afterwards while walking back to our hotel we discovered a little local stall where a friendly lady was selling delicious “Yoba Manju”, a Nikko speciality fried pastry containing red adzuki bean paste. 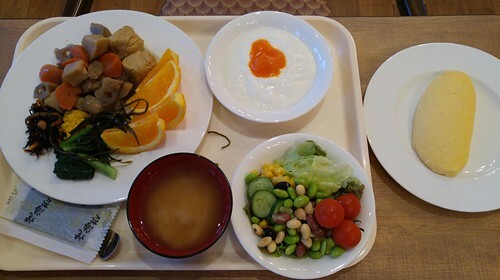 Be aware that many restaurants and cafes in Nikko close really early by late afternoon and you can only eat dinner at the Nikko Station Hotel Classic if you check-in before 6pm. We eventually found some young Japanese people who spoke English. They kindly guided us to a restaurant operated by a group of old ladies. 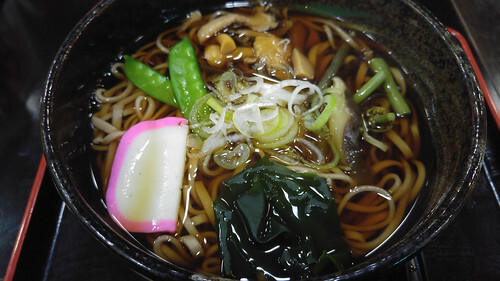 The helpful youngsters asked the old ladies to serve us vegetarian food so we enjoyed Buckwheat Soba Noodles with vegetables and mushrooms for dinner. In the morning we enjoyed breakfast at the Nikko Station Hotel Classic. 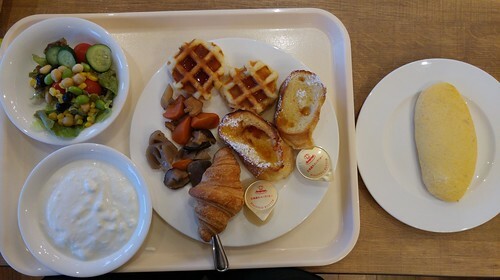 You have the choice of choosing from a buffet of Western and Japanese style foods for breakfast and the option of an omelette made on the spot which suited us just fine.